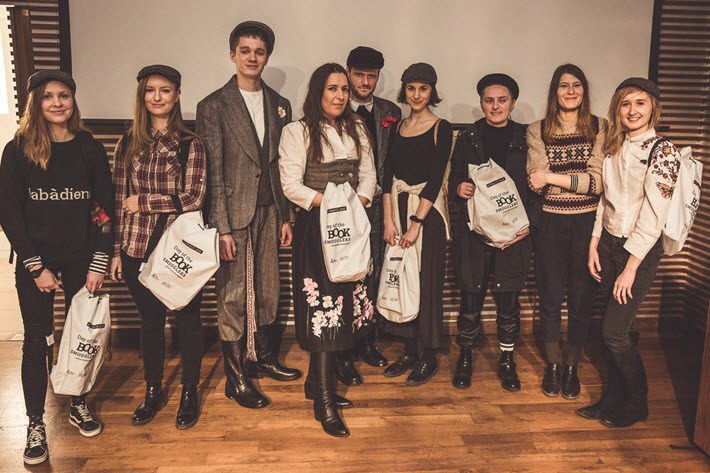 Taking to the streets on Lithuania’s annual ‘Day of the Book Smugglers,’ a team of fashionable book runners delivered Lithuanian writings to agents’ offices, publishing houses, and media newsrooms ahead of the London Book Fair. 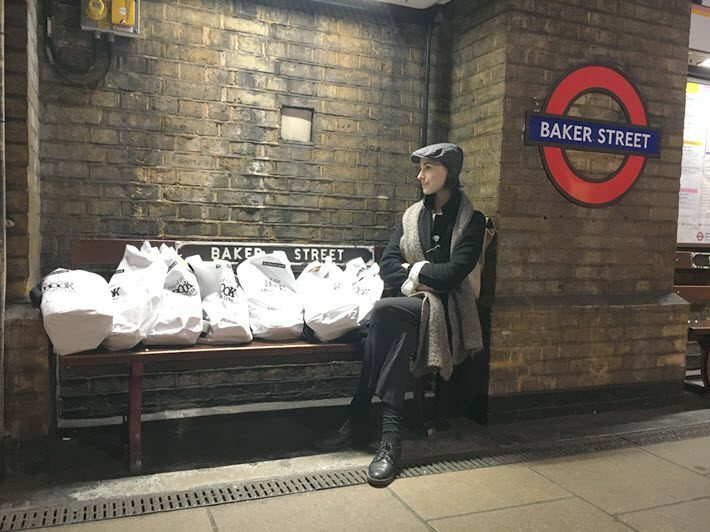 T today (March 16), the Lithuanian Culture Institute sent modern-day “book smugglers” fanning out across London to deliver bags of Lithuanian writings to key cultural offices—in advance of the London Book Fair’s Market Focus, April 10-12, on the Baltic book markets of Lithuania, Latvia, and Estonia. 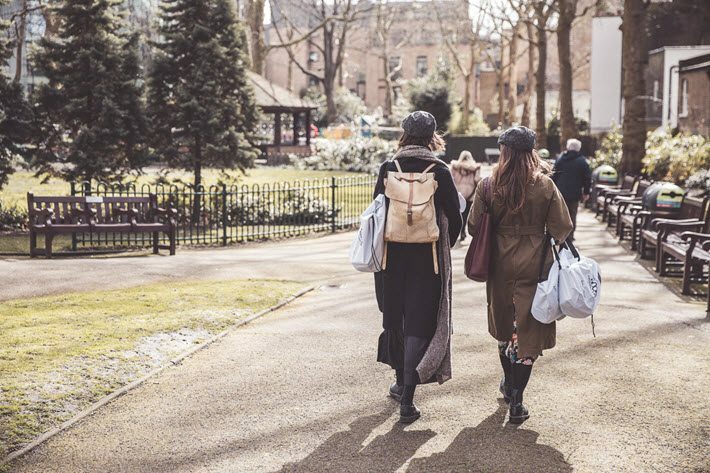 Lithuanian designer Juozas Statkevicius in his 2017 S/S couture collection inspired the notably fashionable look of the participants, who turned heads as they made their way from the Free Word Centre in Clerkenwell to a list of target locations—heavy on literary agents’ offices. Their stops included Amazon Publishing’s headquarters in the British capital, Aitken Alexander Associates, the BBC, The Big Green Bookshop, DHH Literary Agency, Janklow and Nesbit, Libreria, The Monocle, Picador, The Poetry Society, Southbank Centre, The Sunday Times, and Writers’ Centre Norwich. Handily, the books toted in the bags arrived at each destination with rights information on Lithuanian titles coming to the fair and on titles being published in the UK this year. The swanky smugglers opened the day with author Kristina Sabaliauskaitė, who has lived in London since 2002. Born in Vilnius and known for her Silva Rerum four-part historical novel series, Sabaliauskaitė is one of the Baltics’ trio of writers who will be specially honored in London Book Fair’s Author of the Day program, as we’ve reported earlier. The day is a recognition accredited by UNESCO for its cultural distinction: book smuggling is recalled annually in Vilnius on the birth date of Jurgis Bielinis, who was known as “the king of knygnešiai,” the book smugglers who spirited banned books into Lithuania as part of the resistance to Russian hegemony. Bielinis, 1846-1918, is an early champion of the freedom to publish, a journalist who lived with a bounty on his head for much of his career in contraband. He was a key organizer of the resistance to Russian oppression, part of an underground network of as many as 3,000 Lithuanians, during Moscow’s crushing press ban of 1865 to 1904, the period of the American Civil War and the formation of modern Italy. It’s said that the smugglers moved as many as 5 million forbidden books into Lithuania, establishing patterns of subterfuge said to have been revived between 1940 and 1990 in resistance to the Soviet occupation. The ban outlawed all Lithuanian language publications printed in the Latin alphabet within the Russian empire in an effort at “russification,” allowing only work printed in Cyrillic. A proponent of an independent Lithuania, Bielinis is said to have died without seeing the Vilnius Conference that would declare the principles of sovereignty for the nation. The country this year celebrates a century since that Restoration of the State, as it’s known, as a standalone nation. Today, special guests at the UK’s promotional event included London Book Fair director Jacks Thomas; Lithuanian Embassy cultural attaché Justė Kostikovaitė; the Lithuanian Culture Institute’s director Aušrinė Žilinskienė, and journalist Rosie Goldsmith. More from Publishing Perspectives on London Book Fair is here. And here’s a video from designer Juozas Statkevicius’ 2017 collection show, which inspired the London Day of the Book Smugglers’ outfits. For more on Statkevicius’ work, his site is here.